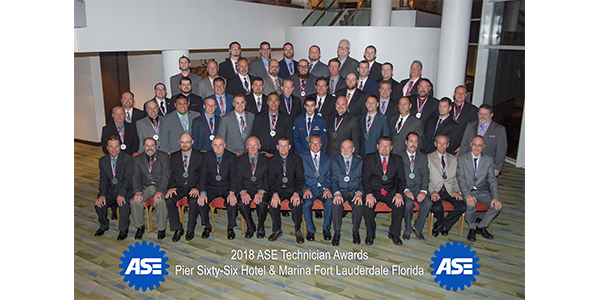 Fifty-two automotive professionals were recognized on Nov. 14, at the Fall Board of Governors meeting of the National Institute for Automotive Service Excellence (ASE) held at Pier Sixty-Six Hotel and Marina in Fort Lauderdale, Florida. The annual awards banquet spotlights top scorers on the ASE certification tests. Forty-one companies from both the OEM and aftermarket segments sponsored the individual technician recognition awards in the Auto, Truck, Collision, Parts and Service categories, along with awards for automotive instructors. In addition to looking for top scores on ASE tests, award sponsors examine on-the-job excellence, community service and other factors when selecting honorees. “ASE has recognized the best of the best in our industry for more than 40 years, and this year we honored 52 outstanding individuals from across the nation,” said Tim Zilke, ASE president and CEO. “We couldn’t do this without the support of our many award sponsors, whose ranks include some of the best-known names in the industry. Their commitment to excellence is reflected in the talented individuals receiving these awards. The enthusiasm and professionalism displayed by all our award winners is a testament to the high quality of ASE-certified technicians and specialists. We are proud to have them as part of the ASE family,” Zilke concluded. Below is the list of this year’s winners. • Navistar/ASE Master M/H Truck Technician of the Year Thomas Marty Plover WI Mid-State Truck Service Inc.
• Pronto Smart Choice/ASE Master Automobile Technician of the Year Troy Herlyn Freeman SD Specialty Automotive Inc.
• Snap-on/ASE Master M/H Truck Technician of the Year Adrian Russ Beavercreek OH J & J Transportation Specialists Inc.